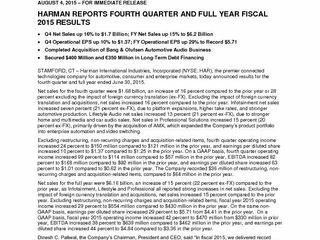 STAMFORD, CT – Harman International Industries, Incorporated (NYSE: HAR), the premier connected technologies company for automotive, consumer and enterprise markets, today announced results for the fourth quarter and full year ended June 30, 2015. Net sales for the fourth quarter were $1.68 billion, an increase of 16 percent compared to the prior year or 28 percent excluding the impact of foreign currency translation (ex-FX). Excluding the impact of foreign currency translation and acquisitions, net sales increased 16 percent compared to the prior year. Infotainment net sales increased seven percent (21 percent ex-FX), due to platform expansions, higher take rates, and stronger automotive production. Lifestyle Audio net sales increased 13 percent (21 percent ex-FX), due to stronger home and multimedia and car audio sales. Net sales in Professional Solutions increased 15 percent (20 percent ex-FX), primarily driven by the acquisition of AMX, which expanded the Company’s product portfolio into enterprise automation and video switching. Excluding restructuring, non-recurring charges and acquisition-related items, fourth quarter operating income increased 24 percent to $150 million compared to $121 million in the prior year, and earnings per diluted share increased 10 percent to $1.37 compared to $1.25 in the prior year. On a GAAP basis, fourth quarter operating income increased 99 percent to $114 million compared to $57 million in the prior year, EBITDA increased 82 percent to $168 million compared to $92 million in the prior year, and earnings per diluted share increased 63 percent to $1.01 compared to $0.62 in the prior year. The Company recorded $36 million of restructuring, non-recurring charges and acquisition-related items, compared to $64 million in the prior year. Net sales for the full year were $6.16 billion, an increase of 15 percent (22 percent ex-FX) compared to the prior year, as Infotainment, Lifestyle and Professional all reported strong increases in net sales. Excluding the impact of foreign currency translation and acquisitions, net sales increased 15 percent compared to the prior year. Excluding restructuring, non-recurring charges and acquisition-related items, fiscal year 2015 operating income increased 29 percent to $554 million compared to $430 million in the prior year. On the same non-GAAP basis, earnings per diluted share increased 29 percent to $5.71 from $4.41 in the prior year. 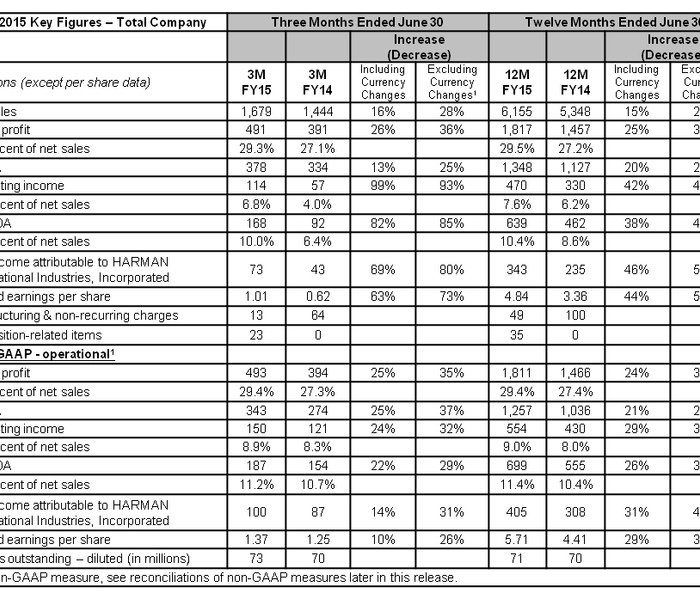 On a GAAP basis, fiscal year 2015 operating income increased 42 percent to $470 million from $330 million in prior year, EBITDA increased 38 percent to $639 million compared to $462 million in the prior year, and earnings per diluted share increased 44 percent to $4.84 compared to $3.36 in the prior year. The Company will hold an Investor Day in New York City on Thursday, August 6, 2015 and will provide financial guidance for fiscal 2016. 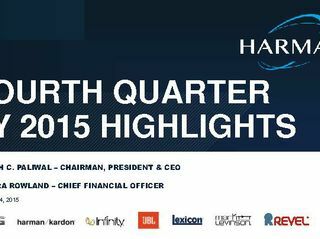 Gross margin for the fourth quarter of fiscal year 2015 increased 210 basis points to 29.4 percent. The improvement was primarily due to the impact of higher sales volume leveraging a more efficient fixed production cost base and the expansion of the Company’s product portfolio into enterprise automation and video switching. In the fourth quarter of fiscal year 2015, SG&A expense as a percentage of net sales increased 150 basis points to 20.4 percent, primarily due to the expansion of the Company’s product portfolio into enterprise automation and video switching and investments in marketing and research and development. At 11:00 a.m. EDT today, HARMAN’s management will host an analyst and investor conference call to discuss the fourth quarter and full year results. Those who want to participate via audio in the earnings conference call should dial 1 (800) 735 5968 (U.S.) or +1 (212) 231 2902 (International) ten minutes before the call and reference HARMAN, Access Code: 21771673. In addition, HARMAN invites you to visit the Investors section of its website at: www.harman.com where visitors can sign-up for email alerts and conveniently download copies of historical earnings releases and supporting slide presentations, among other documents. The fiscal fourth quarter earnings release and supporting materials were posted on the site at approximately 8:00 a.m. EDT today. A replay of the call will also be available following its completion at approximately 1:00 p.m. EDT. The replay will be available through Wednesday, November 4, 2015 at 1:00 p.m. EDT. To listen to the replay, dial 1 (800) 633 8284 (U.S.) or +1 (402) 977 9140 (International), Access Code: 21771673. If you need technical assistance, call the toll-free Global Crossing Customer Care Line at 1 (800) 473 0602 (U.S.) or +1 (303) 446 4604 (International). HARMAN (harman.com) designs and engineers connected products and solutions for automakers, consumers, and enterprises worldwide, including connected car systems, audio and visual products, enterprise automation solutions; and connected services. With leading brands including AKG®, Harman Kardon®, Infinity®, JBL®, Lexicon®, Mark Levinson® and Revel®, HARMAN is admired by audiophiles, musicians and the entertainment venues where they perform around the world. More than 25 million automobiles on the road today are equipped with HARMAN audio and connected car systems. The Company’s software services power billions of mobile devices and systems that are connected, integrated and secure across all platforms, from work and home to car and mobile. HARMAN has a workforce of approximately 27,000 people across the Americas, Europe, and Asia and reported sales of $6.2 billion during the 12 months ended June 30, 2015. The Company’s shares are traded on the New York Stock Exchange under the symbol NYSE:HAR. Except for historical information contained herein, the matters discussed in this earnings presentation are forward-looking statements within the meaning of Section 21E of the Securities Exchange Act of 1934, as amended. One should not place undue reliance on these statements. The Company bases these statements on particular assumptions that it has made in light of its industry experience, as well as its perception of historical trends, current market conditions, current economic data, expected future developments and other factors that the Company believes are appropriate under the circumstances. These statements involve risks, uncertainties and assumptions that could cause actual results to differ materially from those suggested in the forward-looking statements, including but not limited to: (1) the Company’s ability to maintain profitability if there are delays in its product launches or increased pricing pressure from its customers; (2) the loss of one or more significant customers, the loss of a significant platform with an automotive customer, or the in-sourcing of certain services by the Company’s automotive customers; (3) fluctuations in currency exchange rates, particularly with respect to the value of the U.S. Dollar and the Euro; (4) fluctuations in the price and supply of raw materials including, without limitation, petroleum, copper, steel, aluminum, synthetic resins, rare metals and rare-earth minerals, or shortages of materials, parts and components; (5) the inability of the Company’s suppliers to deliver products at the scheduled rate and disruptions arising in connection therewith; (6) the Company’s ability to maintain a competitive technological advantage through innovation and leading product designs; (7) the Company’s ability to integrate successfully its recently completed and future acquisitions; (8) the Company’s ability to attract and retain qualified senior management and to prepare and implement an appropriate succession plan for its critical organizational positions; (9) the Company’s failure to maintain the value of its brands and implementing a sufficient brand protection program; and (10) other risks detailed in the Harman International Industries, Incorporated Annual Report on Form 10-K for the fiscal year ended June 30, 2014 and other filings made by the Company with the Securities and Exchange Commission. The Company undertakes no obligation to publicly update or revise any forward-looking statement except as required by law. This earnings release also makes reference to the Company’s awarded business, which represents the estimated future lifetime net sales for all customers. The Company's future awarded business does not represent firm customer orders. The Company reports its awarded business primarily based on written award letters. To validate these awards, the Company uses various assumptions including global vehicle production forecasts, customer take rates for the Company’s products, revisions to product life cycle estimates and the impact of annual price reductions and exchange rates, among other factors. 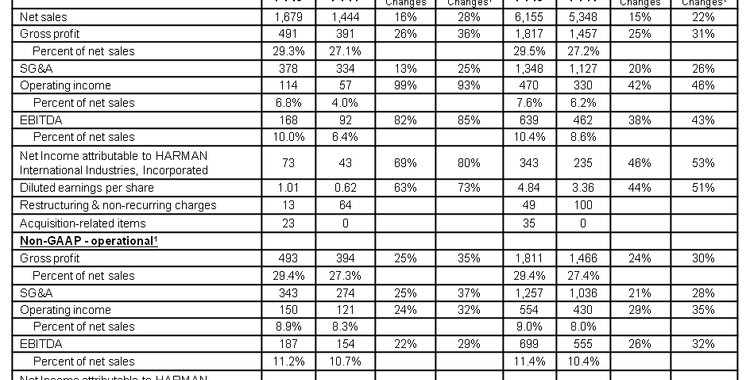 These assumptions are updated and reported externally on an annual basis.